Simple stranded colorwork with a modern graphic design, Venn Diagrams combines traditional fit with geometric contemporary visual style. For the samples, I used a combination of bold and neutral colors, suitable for both men and women; color choices are endless, allowing you to select the perfect match of colors for the wearer. Venn Diagrams is one of a bundle of modern stranded hats featuring strong motifs for fresh style, and is pictured with some of the companion designs. Size: 19” brim circumference and 9” tall, unstretched. 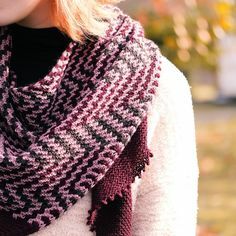 The pattern consists of a 13 st and 18 row repeat, and accommodates heads from 20-23” in circumference; to adjust the size further, go up or down a needle size. 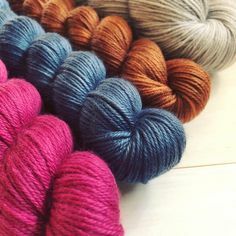 Yarn: Cascade 220 (100% peruvian highland wool; 220 yards/200m/100g), Harrisville Designs Harrisville Highland (100% pure virgin wool; 200 yards/182m/100g), Patons Wool Worsted (100% wool; 210 yards/192m/ 100g), Blue Sky Fibers Woolstok Worsted (100% fine highland wool; 123 yards/112m/50g), Grey hat shown in Cascade 8400 Charcoal Grey (A) and Harrisville 81 Mustard (B), maroon hat shown in Patons Plum Heather (A) and Woolstok 1301 Storm Cloud (B); 1 skein of each color, or approximately 120 yards A and 50 yards B of worsted weight wool yarn. Other Materials: US 8 (5mm) 16” circular needle and dpns, or 32” circular needle if using Magic Loop, or size to match gauge; Stitch markers (7); Yarn needle. Gauge: 19 st and 24 rows/4” in stranded pattern, unstretched after blocking; 1 repeat of 13 st and 18 rows is 2.75” wide and 3.5” tall.